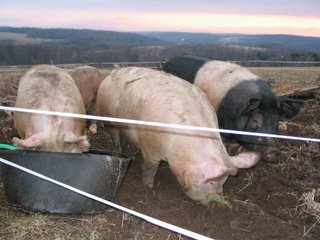 I finally got the pigs out into the garden on Saturday. We decided to expand the garden a little bit this year because it always seemed like we didn't quite have enough room for all the squash and sweet corn we wanted to grow. The pigs do a great job in killing off the sod that we need to get rid of. Besides, they didn't have anything constructive to do until the cows go out on pasture and they can get into the cowshed to start turning the bedding pack into compost. I have a junky old horse trailer parked in the garden for the pigs to spend the night in, but so far they have opted not to. I'm certainly not going to try and force them. These pigs are my breeders. There are gilts (young sows), and the black and white one is the boar. The white ribbons in the foreground is electric fence polytape. Pigs are very respecting of electric fence, but they have to be able to see where it is. Last year a Nor'Easter blew through on turkey processing day (November 22nd). It was plenty cold during the day while we were processing, but it turned especially nasty in the evening when people were due to come pick up their Thanksgiving turkeys. It was about 20 degrees with 40 mph winds. 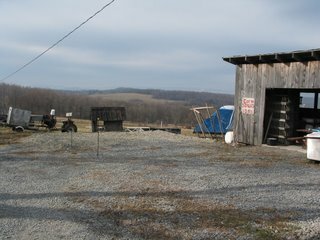 In the past our customers have picked up their birds at our processing building that we call the Gut Hut. The birds have always been in the chill tank until people arrive to pick them up. Unfortunately we always seemed to have a bottleneck because of the time it took to pull the chickens out of the tank, drain the water out of them, bag them, weigh them and figure up the bill. Sometimes we had five people waiting for their birds. 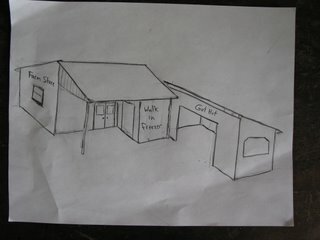 Anyhow, this problem, combined with bad weather and a desire to be able to sell our products year round gave us the urge to build an on farm store. Last week I had 22 tons of gravel (modified) delivered and began to level up a spot to put the store. It is going to be connected to the existing Gut Hut. 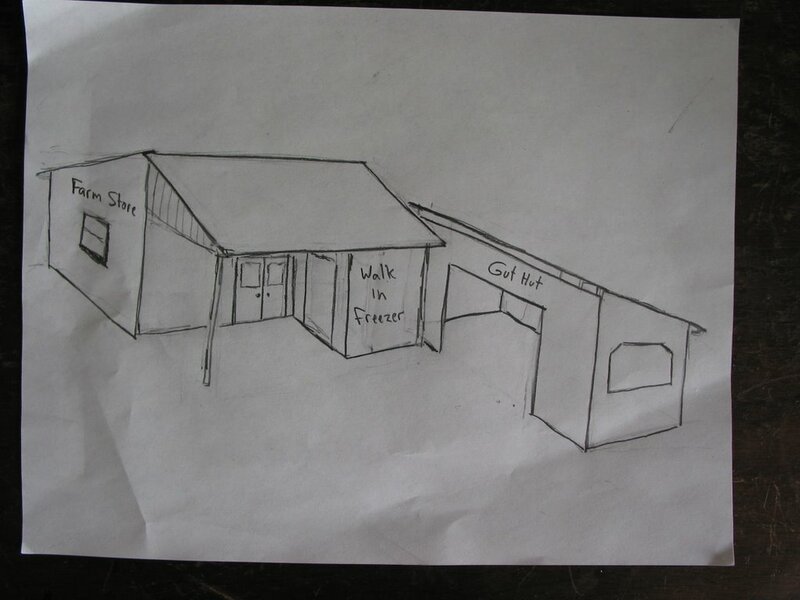 As you can see from the (bad) drawing it will have a shed roof that will extend towards the processing building. We are trying to get ahold of a walk in freezer that we could put under that shed as well as a fridge for eggs and possibly a table to sell some produce off of when we have a surplus from the garden. A walk in freezer would make it possible for us to get chicken out of the chill tanks and bagged up before people arive to help take care of the bottleneck. The store itself will have a bunch of chest and upright freezers in it so that we can sell frozen chickens and turkeys, as well as beef and pork by the individual cut. Currently we only sell beef and pork by the half and whole. I plan to post the progress on this building as we get it built. Besides, Colleen Kane, who owns Sea Hag Soaps in Brackney gave us a really great cash register that she wasn't using anymore, so we have to build a spot to use it. I was a little afraid we had missed the boat to frost seed some clover into our pastures this spring. It was 60 degrees here over the weekend, and got nowhere close to freezing over night. In order to frost seed we need the night time temperatures to go low enough to freeze a crust on the soil, which causes it to honeycomb. That opens up cracks for the seed to land in. 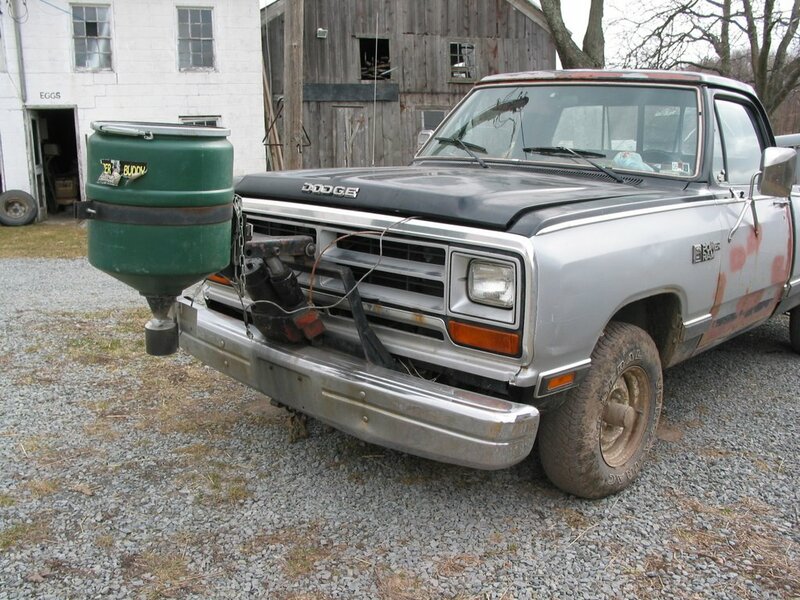 We got it last night and I had borrowed the broadcast seeder that the Susquehanna County Conservation District owns. 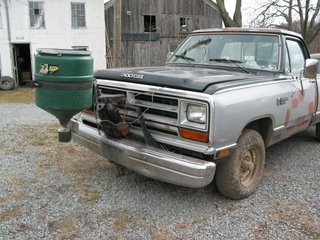 I knew I would have 3 kids with me so I ended up mounting the seeder on the snow plow lift arm on the front of the pickup truck. We got going on the seeding at about 7 this morning and by 8:30 we had covered the 13 acres I had planned to do. This is the first time we have tried frost seeding so I will be interested to see what happens. There is no clover in those fields now so any we see this summer we can take credit for.